The challenge of improving run speed falls primarily to two main physical derivatives: your cadence and the length of your stride. 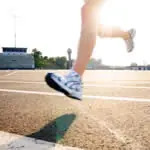 And, either increasing your cadence or increasing the length of your stride -- both of those will, or a combination of the two -- will lead to an improved overall run speed. But becoming a better runner is more than just improving the speed at which you run. It is also about improving comfort and your ability to sustain any given pace for a longer period of time. This is where technique can have a role in your running. While there are many different things you can do to improve your technique, here are my top three. The first one is to improve that cadence. You can go out right now, start running, and get up your cadence between 90 and 92 foot strikes per minute (or RPMs). If you have a GPS device with a cadence sensor, your work is practically already done. If you don't have a cadence sensor, you can use your stopwatch, and every 15 seconds just count the number of times one foot hits the ground. You want to strike the ground between 22 and 23 times every 15 seconds. Once you get that cadence up between 90 and 92 rpms your body begins to assume a lot of the proper positioning. You are not inclined to over-stride; you are forced to have a slightly more efficient gait. And you can do that right now as you lace up your shoes and walk out the door. Number two, you can learn to breathe from your belly. A lot of people tend to run at a low Zone 3 or moderate tempo pace. This is just hard enough that you need to change how you breathe, but not hard enough to really induce any specific fitness adaptation. One of the characteristics of this level of intensity is what I call "tension" of breath. It's a subtle tensing, part of what makes us feel like we are "working," and it happens in your upper chest. What I want you to do on your next run is to move that breath down. Relax your diaphragm -- just below the front of your rib cage and just above your belly button -- and really try and do your best to get your breath to naturally come from that space. Let the diaphragm do its own work without forcing it (as you do when breathing within your chest). That relaxation process is going to translate to an overall relaxed posture throughout the body, enabling you to become much more comfortable at your given pace. The number three thing you can do to start improving your running technique today is to take off the watch. Remove the watch, put it on the table and slowly back away. Stop focusing on time; stop benchmarking yourself in every single run you do. Take a period of time to get back to the basics: it could be two or three days, maybe you need a week. Discover why you enjoy running. Find some new places to run. As you do this, focus on your cadence and focus on that relaxed breathing. Some combination of these three elements can help you create the conditions in which you can improve your running technique...and the best part is you can start today. The following article is pulled from the Marathon Nation members only site. If you'd like more running technique information, please consider signing up for their free 30-Days to a Better Runner email series, which starts on May 3, 2010. Marathon Nation is a brand new virtual team of marathon runners. Coach and founder Patrick McCrann is building a unique marathon community using training plans, forums, podcasts and videos to create an incredibly effective and affordable team coaching solution. Learn more about Marathon Nation and sign up for our Wait List online.